This is my wish for you. Christmas is my celebration, but I also grew up in a Jewish neighborhood with a love of Hanukkah. For either holiday and the beliefs of still others -- Peace Forever. My Victorian Christmas programs mention Christmas cards started in the 1860s. Here's a beautiful example from 1900, the year before Queen Victoria died. 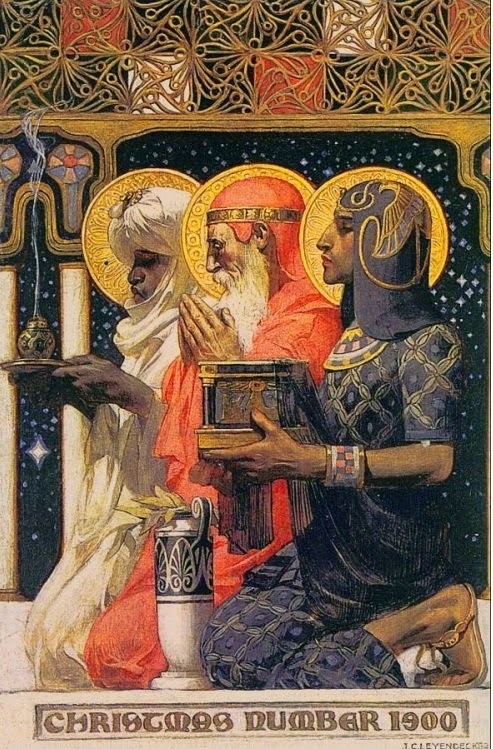 by American artist, J.C. Leyendecker. Those kings or Wise Men traveled because of the prophecy that a Prince of Peace would be born and a most unusual star would guide them to Him. In our century we could use this more than ever. By the way, Henry Van Dyke wrote a lovely story of the Fourth Wise Man. It's too long (50 pages) for me to post in my Keeping the Public in Public Domain, but I recommend it heartily. The novella, The Story of the Other Wise Man, can be found at Project Gutenberg. I first heard it told as an entire program by an Indiana storyteller who has gone to tell stories in the hereafter. I've forgotten his name, but definitely not the story. Give a Cheer for Summer Reading!